After lunch, we sat and talked about crazy stuff, we chatted a lot about our mood swings and how the feeling of reaching the age of 40 impacts the choices we make daily. I'm not kidding - I feel pretty old right now. Or rather my system is beginning to feel its impact. Two decades ago, I could party all night and crash early morning and still feel cool. Not anymore. If I don't get proper hours of sleep, I suffer continuous headaches throughout the following day. I have begun to crave for very sweet foods too, unlike the earlier years when it didn't interest me so much. Sleep has become a very touchy thing - the slightest sound and I cannot get back to sleep for hours, and I used to tease my grandmother about that years ago! These are these little signs of growing older that I have started noticing about myself - perhaps because I am looking for them like a picky eater. Nope, my hair is still black and I am eagerly waiting for silver white strands. Of course, the wise ones say that age is just a number and to an extent, they are right. My grandmother was always bubbly like a teenager whereas I was behaving more like a grandmother while I was a teenager. So, age is also about how you feel within. Millie and I were sharing our experiences about growing older and it felt cool to share it with someone you feel totally comfortable with and can understand which planet you are coming from. By evening, we were full of joyous smiles as Anushka worked hard on getting the rangoli done to her creative satisfaction and we kept supporting her in every way possible. I love the way she brought out the colors and shapes to suit her imagination. 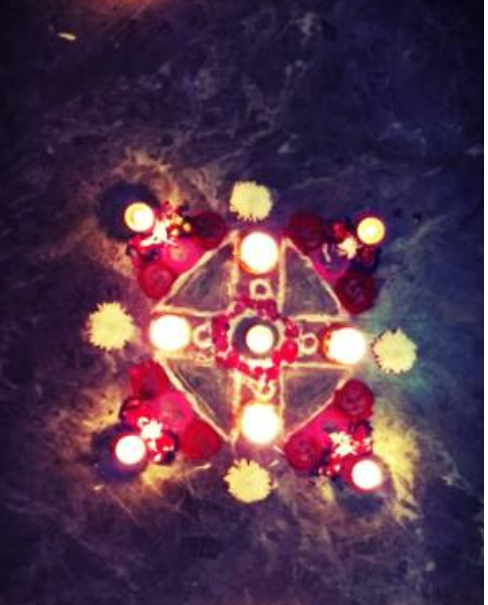 Since we had no crackers this year, my son joined in for the first time ever to decorate diyas and flowers. It delighted me to see that he enjoyed it so much that he pitched in to do this on the following day too! Now I am curious to know how you share your vulnerabilities and whether it happens easily or you work towards developing it. If you have some tips for me, I'd love to hear from you. You say, "Do write in". Do you have any preferances like a particular linguistic group or a particular caste group or particular group of friends ? It is better to make it clear. Otherwise some "BIN BULAAYE MEHMAN" may come & blabber something. The mind is ALWAYS young. Only the body becomes older.